NETWORK FINALS: There were no changes from the preliminary Sunday numbers. CABLE HIGHLIGHTS: Even mighty HBO felt the drain of Memorial Day weekend, as GAME OF THRONES sank by 0.71 to 3.25. The rest of the line-up fared better, with SILICON VALLEY down 0.06 to 0.88, and VEEP actually up a tick to 0.43. On Showtime, HOUSE OF LIES slipped 0.01 to 0.09, and PENNY DREADFUL was downright impressive, rising 0.03 to 0.20. Starz’s THE GIRLFRIEND EXPERIENCE dropped off the chart, down 0.03 to 0.03/161K. Meanwhile, AMC’s experiment with the 2d week of PREACHER didn’t impress, with a 0.20/643K rerun of the pilot followed by a new TALKING PREACHER at 0.15. On Adult Swim, MIKE TYSON MYSTERIES dropped 0.12 to 0.51, and MR PICKLES ticked down to 0.48. Hallmark’s GOOD WITCH was steady at 0.23. USA’s MOTIVE rose 0.02 to 0.20. 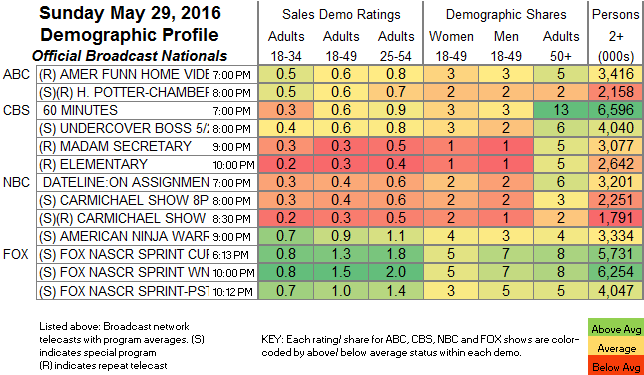 On the unscripted side, Discovery’s NAKED & AFRAID fell 0.09 to 0.62. A Univision LIGA soccer match hit the Top 10 at 0.52. ESPN’s MAJOR LEAGUE BASEBALL game was also in the Top 10 at 0.46. 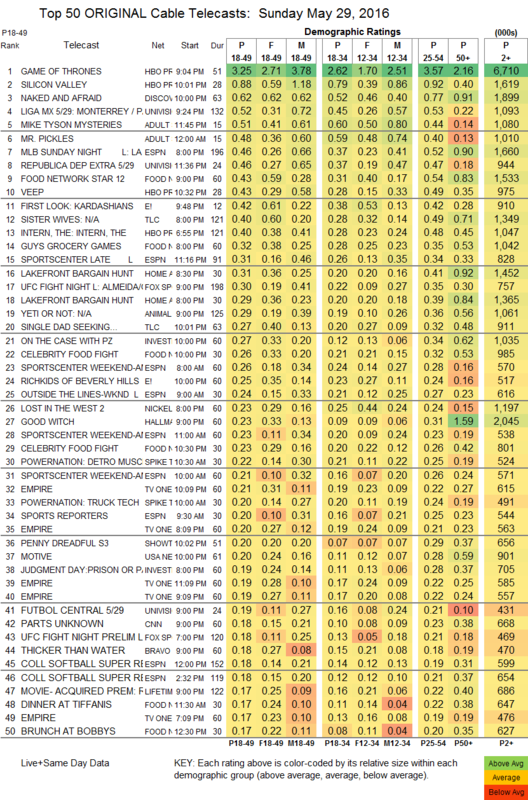 On Food Network, FOOD NETWORK STAR held at 0.43, GUY’S GROCERY GAMES was at 0.32, and CELEBRITY FOOD FIGHT was at 0.26. It’s worth noting that fans of KEEPING UP WITH THE KARDASHIANS were so desperate for their weekly fix that a 12-minute “first look” on E! had a 0.42 rating, after which RICH KIDS OF BEVERLY HILLS was down 0.01 to 0.25. On TLC, a 2-hour SISTER WIVES rose 0.05 to 0.40, and SINGLE DAD SEEKING gained 0.07 to 0.27. Bravo’s THICKER THAN WATER dropped 0.06 to 0.18. Sunday ratings chart last night, last year and last week. Ratings for NBC 7:30-11:00 and CBS 7-8 pm are adjusted from the fast nationals to estimate the adjustment in the official nationals for these live feed programs.